Whether you’re on the road, on the mountain, or on the half-pipe, your bike won’t experience top performance without proper tire pressure. In fact, bike maintenance is fairly simple, and more often than not, the only thing you need to do before each ride is put air in your tires. 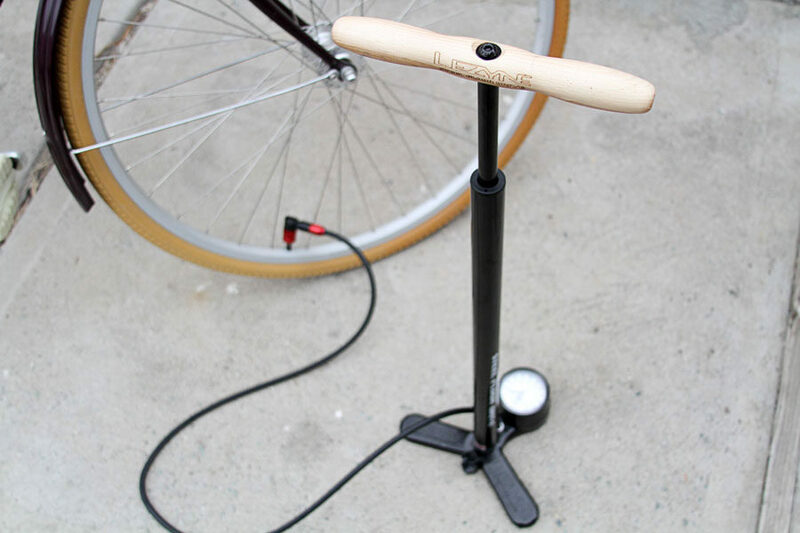 The bike pump, then, is your greatest friend in cycling, but the options can be overwhelming. The first pump characteristic you’ll want to consider is its versatility. Instead of having several specialized pumps, find one pump that can do it all. For example, if you want one pump that can inflate any kind of bike tire, you’ll need one that’s compatible with both Presta and Schrader valves. Want to use your pump for basketballs and soccer balls, too? Make sure your pump can hold a sports needle. No one should have to work up a sweat while using their pump, but with the wrong setup, adding pressure to your tires can seem like a full body workout. Look for pumps that have flexible air hoses, making a pump achievable at any angle. Also, look for hoses that have a strong seal, so no energy gets wasted on leaking air. Lastly, look for a long, helpful handlebar, a solid foot, and a readable gauge. Finding a bike pump with high PSI will give you versatility, ease, and speed. Different tires require different PSI levels, so purchasing a pump on the higher end will allow you to pump up the low, the high, and everything in between. The higher PSI a pump can handle, the easier the air will release in your tire, giving you a lot less work to do. Lastly, the higher the PSI, the faster the tire inflates, giving you speed. Pick a pump with 120 PSI and above. 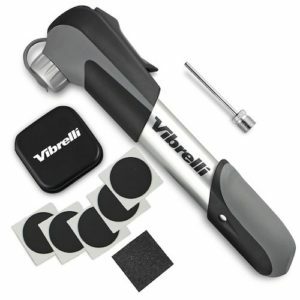 While most hand pumps can be a sweat-inducing pain to use, this hand-held mini bike pump packs a punch. It comes with and no-leak hose and the power of 260 PSI and is compatible with both Presta and Schrader valves. It’s a small 7.7 inches long and comes with a simple bike mount that allows you to enjoy its reliability anywhere you ride. This Vibrelli pump is another strong contender in the mini-pump category. At 120 PSI with a “super fit clever valve” that can match a Presta or Schrader, it’s more than capable of fulfilling your tire pressure needs. This pump also comes with a mounting bracket and glueless puncture kit for when your ride suddenly gets a little too rough. 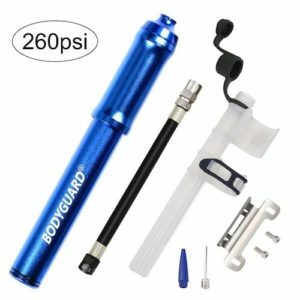 The biggest difference with this transportable mini bike pump is that it comes with an extremely flexible air hose that has an integrated pressure gauge. It reaches 120 PSI, is durable, and boasts a no-rattle bike mount. With this little 8.75-inch companion, you can feel confident anywhere you adventure. While floor pumps can’t be taken out on your ride, they allow the use of legs and body weight for pumping instead of just your arms. 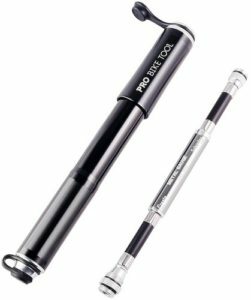 Topeak’s floor pump is an excellent choice. Its extra long and flexible hose is on a 360-degree pivot with a dual-sided valve that can be used for Presta and Schrader. It has an easy-to-read pressure gauge and comfortable over-sized handles. 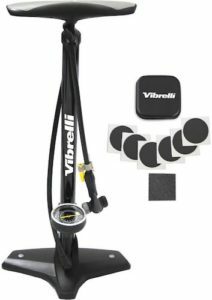 This Vibrelli floor pump is one of the most reviewed on the market. It stands on the ground with a stable 12-inch wide foot plate, reaches up to 160 PSI, easily adapts for Presta and Schrader, and has a clear gauge, making the pumping process a total ease. It also comes with a sport needle and inflating attachment.